Maluhia Hanalei è una bella casa in stile hawaiano a un solo isolato dalla magnifica due miglia mezzaluna spiaggia di fama mondiale Hanalei Bay. Gli arredi, i servizi e l'ambientazione ne fanno una meravigliosa casa vacanze da cui godersi le meraviglie di North Shore di Kauai. A due minuti a piedi dalla casa è magnifico Hanalei Bay e la sua famosa spiaggia di sabbia bianca. Una breve passeggiata ti porterà al pittoresco, storico centro di Hanalei, con la sua meravigliosa gamma di ristoranti, negozi e gallerie. A dieci minuti di macchina troverai numerose spiagge bellissime e una grande varietà di attività per tenervi occupati. La casa si trova alla fine di un cul-de-sac, posizione arretrata rispetto alla strada, e un lungo viale in un quarto di acro meravigliosamente paesaggistico adiacente ad una zona di conservazione. L'ambiente è lussureggiante, verde, riservato, silenzioso, molto appartata, ma solo un isolato dalla spiaggia ea cinque minuti a piedi dal centro città. Una posizione ideale. Maluhia Hanalei è una casa unifamiliare in grado di ospitare fino a 10 ospiti. Gruppi di fino a 6 possono affittare separatamente le spaziose tre camere da letto, due bagni al piano superiore della casa. Vedere le note sotto il grafico nella pagina delle tariffe per le tariffe. C'è anche un grazioso appartamento al piano giardino con due camere da letto, soggiorno, cucina e bagno completo per un massimo di un ulteriore 4 persone. Questo può essere affittato separatamente o con il resto della casa. Vedi VRBO 507143 per l'elenco separato degli appartamenti. La casa è arredata con gusto e completamente attrezzati. I gruppi più numerosi troveranno che tutta la casa unisce per fare una casa di vacanza ideale per un massimo di 10. Le singole suite dare ai gruppi più piccoli all'interno dei grandi uno i propri spazi separati e il piano superiore ha un ampio piano piano molto aperto con un sacco di spazio per tutti per raccogliere per i pasti e visitare. Gli ospiti potranno godere della splendida doccia esterna, la miriade di uccelli sugli alberi, le splendide albe e tramonti, la vegetazione lussureggiante e fiori ovunque, e le belle viste tropicali dalle ampie verande e terrazze. L'Hibiscus, la 3BR, la casa principale 2BA e la suite da giardino Plumeria 2BR possono essere affittate separatamente. Vedere la sezione Note nella pagina delle tariffe per ulteriori informazioni. Guarda il video di You Tube, Maluhia Hanalei, per avere una splendida vista della casa e dei suoi dintorni. Permesso TVRNC n. 1020 sull'isola Contatto Karen LaMore Si prega di non contattare per le prenotazioni. This is the perfect place to stay if you are looking for tranquility and homey-ness from your vacation. The beds are comfortable and soft, the bathrooms immaculately clean, and the kitchen is well-stocked with dishes and cookware for any meal. We especially appreciated the view from the wrap-around deck on the second floor, which overlooks the small stream running behind the house. Be aware that the house has no air conditioning, but our family found the temperature & humidity very pleasant. The owner's advice for local restaurants, markets and activities made our stay very enjoyable. We can highly recommend staying here! Spacious, sunny home with everything you could possibly need. Perfect location. 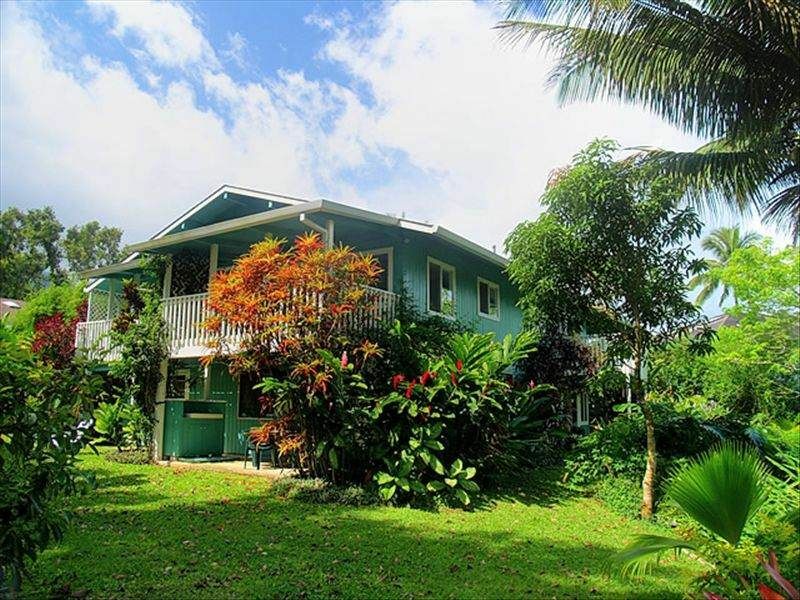 Marney’s house is a gorgeous, quiet retreat that is super convenient to Hanalei bay. We found everything we needed and felt absolutely at home. This was our big family trip we have been talking about & saving for the last couple of years. We spent 7 nights on Kauai. We were a group of 13 (10 adults ages 21 to 50 & 3 grands ages 4 months, 2 & 3-1/2) & we wanted a house close to the beach & big enough for sleeping arrangements & spending quality time together. This house was perfect for that. It truly is a 3 minute walk to the beach - a beautiful, sandy beach that was fun for all ages - & a 5 minute walk to the town of Hanalei. We rented the 3 bedroom main part of the house, “Hibiscus” (2nd floor) & the 2 bedroom apartment on the main level, “Plumeria”. The house & apartment were as described, clean, & well stocked with everything you could need. When at the house we spent most of our time in Hibiscus. There was plenty of room for us all in the open floor plan of the living/kitchen/dining area of the house. The wrap around deck gave us even more space. There were toys & books for the kids as well as books, games, & movies for everyone else. There were plenty of beach chairs, boogie boards, beach towels, some beach toys, & beach umbrellas as well as 2 wagons to get everything to & from the beach, with a little space for a kid or 2. The house is surrounded by tropical plants & sounds, with a small yard in the back. The driveway had plenty of room for the 3 cars we rented. When at the house it does not feel like you are in a neighborhood cul-d-sac, but in the tropics. The setting around the house reminded me of when we visited Costa Rica. The master bedroom did seem to stay a little cooler than the rest of the house, which my husband & I appreciated. The deck off the master was wonderful to sit on as well. I do recommend good earplugs for sleeping as there are chickens & roosters in the area, well actually all over the island. With windows open they can wake you up earlier than you may want to be. Marney was very helpful & great with communication. We had a red eye flight home & she allowed us to us Plumeria for that day. It was so appreciated! Beaux was very helpful as well. Would definitely rent this house again for a group & highly recommend it. It was a beautiful home and fully stocked. Just bring your own food and enjoy. Close to everything in Hanalei. The upstairs Hibiscus was the ideal place for our family for two weeks—three adult couples and a five year old child. There was plenty of space for everyone to hang out. There were books, toys, games and puzzles for our granddaughter. The kitchen was very well stocked with everything we could possibly need, from condiments and staples to a blender and a lime squeezer! We used the supplied fold up wagon to haul the chairs, towels and umbrellas (and sometimes our granddaughter) for the short walk to the beautiful beach. The setting is absolutely perfect in this quiet neighborhood and lush setting. We had planned this trip for a long time and were not disappointed with this wonderful house. Marney was extremely helpful with answering all our questions. She even arranged for Beaux to bring a crockpot when we inquired about one.